The Residential Plan Review Division reviews new construction, additions, interior remodeling and demolition of single-family, duplex or two family houses and/or accessory buildings on one lot. Residential construction projects are reviewed for compliance with Chapter 25-2 of the Land Development Code, the 2015 International Residential Code, and Chapter 25-12, Technical Codes (local amendments). These regulations were adopted to protect the character of Austin's older neighborhoods. Check the zoning to determine if the property is within a zoning district that allows for that use. Check if the property is located within a Neighborhood Planning area. Check to see if the property is within an approved district. If the project is on a tract of land that is not platted in a subdivision filed on record with the City of Austin, the applicant will be directed to the Development Assistance Center to determine if the project qualifies for a platting exception. Projects within 100’ of the 100-year floodplain will require additional floodplain review. Any structures 40 years old or older will be forwarded for review by the Historic Preservation Office. View the submittal requirements for new construction and Visitability Ordinance requirements. Building Technical Review Handout - Provides code requirements for residential structures. Residential Technical Review Checklist - for use as a reference tool for frequently overlooked code requirements. Separate permits are required for plumbing, mechanical (air conditioning and heating), and electrical work. All necessary forms and documents must be submitted with each application. Relocation and demolition applications are forwarded to the Historic Preservation Office for review of historic applicability if the structure is over 40 years old. View Residential Building Review applications and checklists. 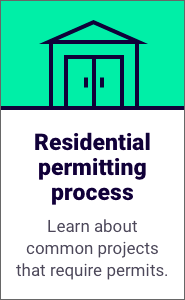 A Residential Express Permit Application may be submitted in person during Walk-In Hours, or via email at dsdexpresspermits@austintexas.gov. Please allow 3-5 business days for processing if submitted via e-mail. View a list of projects that qualify for an Express Permit, provided there are no unresolved issues. Self-Certification for Certified Building Designers and Texas-licensed Architects is offered for certain qualifying projects. Learn more about the Certificate of Compliance Program. On November 19, 2015, the City Council approved revisions to the ADU regulations. A person who is not licensed to perform electrical, mechanical & plumbing work may perform work within a residence and on property owned by the person if eligibility requirements are met. This type of permit is a Homestead Permit. Click here to view Homestead Permit eligibility requirements. If you are eligible for a Homestead Permit, you must apply in person at the Service Center (1st Floor) and file an affidavit stating that the location at which the work is being performed is the person's homestead. Work must still comply with applicable Building Codes, City Codes, and other applicable ordinances. View work exempt from permits. A volume builder is a builder constructing at least 5 single or two-family dwelling units on lots within the same subdivision, within the same townhouse complex, or on a multi-family zoned lot with single or two-family dwellings. The subdivision must have a minimum of 10 lots with the exception of ammended plats already in the program. Administrative waivers will be considered on a case by case basis if a builder does not meet the requirements. Learn more about the Volume Builder Program. Review Times- New review times became effective on May 16, 2017. Reasonable Accommodations under the Fair Housing Act, - On February 16, 2016, the City Council adopted Chapter 2-14 of the City Code which allows City staff to modify a City of Austin requirement (related to residential property) for a person with a disability, and outlines a process for how to request reasonable accommodations. Customers may seek a one-hour preliminary plan review (PPR) by paid appointment for project-specific feedback or interpretation of the Austin City Code. All PPRs are coordinated by the Expedited Building Plan Review Program. For a one-hour preliminary plan review, please complete the Residential PPR Request Form and submit during Intake Hours (see Office Hours) or e-mail your form to ExpeditedReview@AustinTexas.gov. Prices for a PPR vary depending on the disciplines involved and number of disciplines requested. The fees are charged by each discipline’s hourly rate. For general questions regarding Residential Permit Application review processes and procedures, or for basic development-related questions, the Residential Review Division will continue to provide free walk-in sessions. Please know that some questions are too specific and cannot be answered via a phone call. Therefore we strongly recommend you visit us during walk-in hours for a 20-minute free consultation or a one-hour paid consultation. You may also send your questions to ResidentialReview@austintexas.gov. Don't want to wait in line for service? 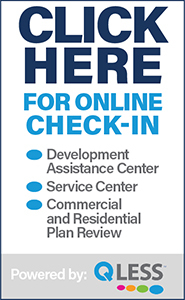 Use our Customer Service Check-In feature to check in for services remotely from home, office or mobile device.